Callender Howorth specialises in luxury interior design for residential interiors and commercial spaces. Our Monaco interior architects offer bespoke services in design, architecture and renovation for a discerning, international clientele. Our diverse portfolio reflects our dedication to our clients’ vision and we work in consultation with them every step of the way to deliver excellence from original concept to the completion of projects. From renovations to redesigns we offer deluxe Monaco interior architecture that will be the envy of your neighbours. The small city-state of Monaco is only 2 square kilometres in size and can’t help but be influenced by its rocky terrain and narrow coastline. For this reason, the natural inclination is to build upwards and the tallest building is the Odeon Tower, which is 170m high and consists of 50 floors. Remarkably, most of the buildings in Monaco aren’t skyscrapers but tend to give that impression due to the steep hills they are built on. More classical buildings, such as the legendary marble and gold Monte Carlo Casino come from the years surrounding the Belle Epoque era. The building was opened in 1863 as a way to save the ruling Grimaldi family from bankruptcy. It became famous as one of Europe’s most opulent edifices with suitably lavish Monaco interior architecture to match. The Palais du Prince is a building with even more history, dating back to 1191; it’s been the home the Grimaldi family for over 700 years. Built in Romanesque Revival architecture and overlooking the glamorous Port de Fontvieille, Monaco Cathedral has become the final resting place of the principality’s VIPs, including Grace Kelly and her husband Prince Rainier III. The unique glass-domed venue is a great example ofMonaco interior architecture and hosts a range of events from art exhibitions to commercial fairs; the Monte-Carlo Philharmonic Orchestra regularly performs there. Monaco is also home to the International Circus Festival held each winter and the International Fireworks held in July. 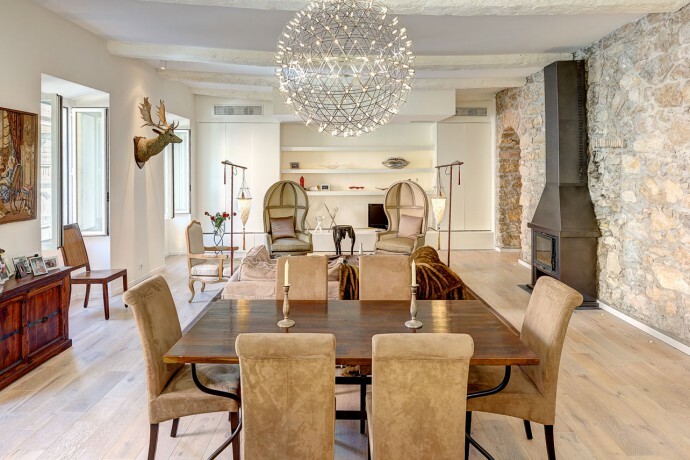 Our Monaco interior architects completed one of the company’s most spectacular projects in nearby Nice. This apartment on Rue Bonaparte was in an exceptional location close to the port but hadn’t been renovated in fifty years. The building was gutted to utilise space for an enormous open plan living area and two upstairs rooms with ensuite bathrooms to give the feel of 5-star hotel suites. Some original fittings were kept, namely, a vintage stone wall and beamed ceilings which add a unique ambience and plenty of character to the space. The upstairs rooms overlook a picturesque courtyard and benefit from custom-fitted lighting. Carefully selected furniture and art ensured the home was light, airy and contemporary in the style of Monaco interior architecture. Monaco is famously cosmopolitan with a mix of nationalities living on its sunny shores. This ensures a packed social and cultural calendar and means you’ll never be short on entertainment. The Grand Prix de Monaco is Formula One’s most hotly anticipated event and the Principality’s most famous event held on the streets of Monte Carlo every May. Aside from the Formula one and yachting opportunities, there are some fantastic walks and places to do sport, such as the iconic Monte-Carlo Country Club, which hosts the Rolex Masters Tennis Championships every spring. Monaco’s favourite chef, Alain Ducasse runs the sumptuous Le Louis XV at Hotel de Paris. It was the first hotel restaurant to be awarded three Michelin Stars, which it has never since lost. It’s also a Monaco interior architect’s dream with its high ceilings and chandeliers, which seem to channel Versailles during its heyday. Everything from the decor and summer terrace to the rare vintage wine menu and Mediterranean haute cuisine is perfection. After a gourmet meal, you can head to one of the many lounge bars or nightclubs in the vicinity, such as Crystal Terrace, Buddha Bar or Jimmy’z Place du Casino. Monaco is very different from France, even though it is located next to it. Monaco warmly welcomes an international crowd; from businessmen to families, everyone is catered for. There are some good schools in the area, such as the International School of Monaco (ISM), which is ideally situated on the port of Monaco. Since the Principality is so small, you’re bound to bump into some famous residents. Celebrities have been flocking to the city-state for years and a number of Formula One drivers, business moguls and musicians call it home for at least part of the year. Jenson Button, Lewis Hamilton, Ringo Starr, Roger Moore, Bono and Shirley Bassey are all residents. Of course, the famous Grimaldi royal family reside there and have undoubtedly utilised leading Monaco interior architects on many occasions. Please contact our team of Monaco interior architects to discuss your requirements. Complete design, build and project management service in Monaco.